All ISO 17025 accredited calibrations include as found, as left data measurement uncertainty. 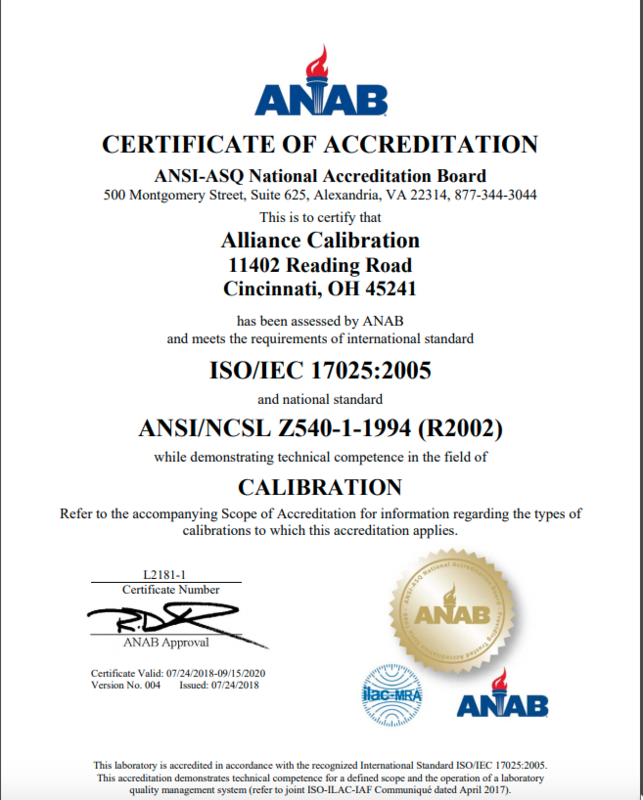 Some labs are compliant to ISO-17025, but Alliance Calibration is accredited by ANAB to ISO-17025. ISO accreditation is important because accreditation ensures the job is done right. The accrediting body is required to audit our laboratory to ensure the work is done correctly. Some labs are compliant to ISO-17025, which means they say they meet ISO standards, but no independent 3rd party validation has occured. ...legitimacy is based on three things. First of all, the people who are asked to obey authority have to feel like they have a voice--that if they speak up, they will be heard. Second, the law has to be predictable. There has to be a reasonable expectation that the rules tomorrow are going to be roughly the same as the rules today. And third, the authority has to be fair. It can't treat one group differently from another.